Very few people understand the work of the old-time strongmen, and fewer yet can accomplish any of their feats. 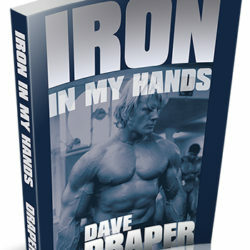 Dave Whitley is one such person, and in this live workshop DVD he’ll show you how some of the strength feats are done. Better yet, he’ll teach you how to use the strongmen’s methods to take your own training to levels you hadn’t imagined. In today’s strength world, the IronTamer is a premier go-to strongman! Very few people understand the work of the old-time strongmen, and fewer yet can accomplish any of their feats. Dave Whitley is one such person, and in this live workshop video he’ll show you how some of the strength feats are done. Better yet, he’ll teach you how to use the strongmen’s methods to take your own training to levels you hadn’t imagined. In today’s strength world, the IronTamer is a premier go-to strongman! You’ll also get to see some of these feats in person — dynamic nail and horseshoe bending, remarkable grip feats and truly powerful demonstrations of singular focus. “There is a lot to learn from old-time strongmen. Unfortunately, the information is scarce and rarely authentic. Fortunately, you have Lessons of the Old-Time Strongmen. David Whitley has studied with top strongmen whose lineage goes back to the greats of yesterday. Let “Iron Tamer” show you impressive feats of strength and teach you how to be very strong and never sore and tired.”–Pavel Tsatsouline, author of Enter the Kettlebell! Dave’s an easy-going presenter whose knowledge, sense of humor and fair play will leave you with new insight… and a smile. The physical DVD is 1 disc totaling 68 minutes.